It’s hard enough to be an astronaut. You basically have to be a genius physical specimen with enough intelligence to understand astrophysics, but not enough self-awareness to fear being strapped to a rocket and hurled into low orbit by a column of fire. 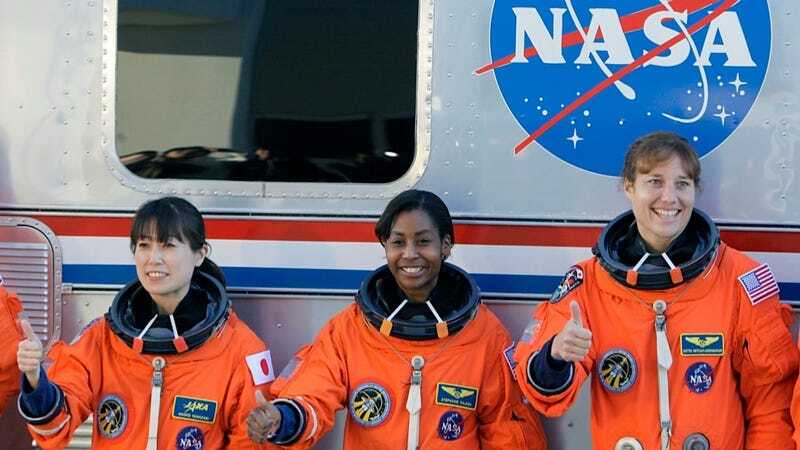 For aspiring female astronauts, though, the selection process is even more rigorous because current restrictions on radiation exposure limit the number of opportunities women have to travel on extended space missions. According to a recent article from Space.com, NASA’s current standards for radiation exposure do not allow either male or female astronauts to accumulate a radiation dose that would raise their risk for developing cancer by more than three percent. The thing is, though, astronauts are exposed to waaaay more radiation than your average, earthbound schlub, who has the benefit of Earth’s Magic UV Shield (EMUVS is, like, a technical term or whatever). An International Space Station dweller, for instance, receives 40 times the average radiation dose of the average person living on Earth, which basically means that that every astronaut who goes on a six-month mission is three steps away from becoming the Fantastic Four’s fifth pity member — Lymphomaniac, the Cancer-Riddled Avenger. Radiation exposure affects men and women in the same way, i.e. it increases their propensity to develop certain cancers. However, according to the current physiological models employed by NASA, women have a lower threshold for space radiation exposure, an unfortunate circumstance that, explains former chief of NASA’s Astronaut Corps. Peggy Whitson, limits the percentage of missions female astronauts can fly. Depending on when you fly a space mission, a female will fly only 45 to 50 percent of the missions that a male can fly. That's a pretty confining limit in terms of opportunity. I know that they are scaling the risk to be the same, but the opportunities end up causing gender discrimination based on just the total number of options available for females to fly. [That's] my perspective. Radiation exposure limits for women are, according to NASA spokesman William Jeffs, about 20 percent lower than they are for men, mostly owing to all those extra ladyparts capable of developing cancer, i.e. uterus, ovaries, breasts. NASA follows the exposure recommendations made by the National Council of Radiation Protection and Measurements, but the models that such radiation limits are based on come (in part) from data collected in the aftermath of Hiroshima. In other words, some of these limits could be outdated, and, according to Whitson, “too confining” for female astronauts hoping for an equal shot at the stars.